Orvieto is part of the Tentative list of Italy in order to qualify for inclusion in the World Heritage List. The setting of Orvieto on the tuffa plateau is impresive. The cathedral with its simple interior and opulent facade is really masterpiece. Another pleasent place of Orvieto is Piazza dell Popolo. My personal highlight is the Chapel of the Corporal with the stained corporal of the miracle of Bolsena - in fact it was the reason for the errection of the Cathedral. I think that one can spend wonderfull time enjoying the histrorical monuments, picturesque streets, excellent white wine and naturally excelent Italian food in Orvieto even without the WHS status. I visited Orvieto by car in July 2013. It is only 1.5hrs away from Florence although it is part of the Umbria region (not Tuscany). Even though it is supposed to be peak season in July, there were only a handful of tourists. Most probably the crowds head primarily to Assisi. 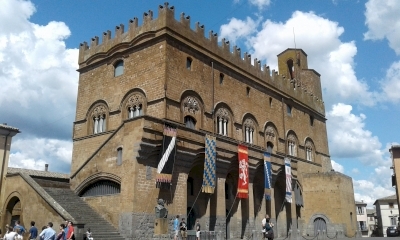 Orvieto is situated on a huge tuff rock visible from the A1 motorway already miles away. The main highlight is the Duomo, which is much more than just another church in a medieval town. It is similar to the cathedral of Siena but lacks a dome and a bell tower. Instead it is intricately adorned with colourful mosaics on the facade depicting scenes from the Bible and a magnificent rose window with Christ's image in the middle. Inside it is quite austere but a walk towards the altar will lead you to 2 chapels full of paintings, murals and frescoes - the Chapel of the Corporal and the Chapel of St. Brisio. Other sights to be seen in Orvieto or St. Patrick's Well, Orvieto underground and the small narrow roads and alleys full of wine bars and small restaurants. The culinary speciality here is the black truffle which is present in most dishes while a unique dessert wine is the Muffa Nobile. I ended my visit by driving uphill towards a small Capuchin convent just opposite Orvieto to enjoy a spectacular panoramic view. No, not another medieval town with a cathedral! I almost had to drag myself to go and see Orvieto. The town is conveniently located along the A1 motorway, and built upon a giant tufa rock. Parking is at lower ground, and from there elevators and escalators take you upwards. After a quick pizza I went looking for the Duomo. From some distance the thing looks like the one in Siena (black and white stripes), but here it's the facade that really knocks you out. There are ornaments all over it: golden and bright coloured mosaics, bas-reliefs. Complete bible stories are told at several scenes. Will this ever become a WHS? Well, you never know. Orvieto is among the relatively recent (2006) additions to the Tentative List, so Italy probably will have plans for it. Like it did with Mantua last year.